So after getting that text message is Diane in league with bad Cooper? Does she know those messages are coming from Mr. C? Does she think they're from someone else. Philip Jeffries maybe? Could she be a doppelgänger too? I can't imagine she is consciously in cahoots with evil Coop, we saw her reaction to him in the prison, has to be someone else in her mind. He's playing her? Based on Diane's reaction to the text message, I think she has definitely met Mr. C before, because she didn't look surprised at all, it wasn't like she was wondering who it was that sent her the msg. As far as the nature of her relationship with Mr. C, who knows. He could be manipulating her and using her, like everyone else he comes into contact with. It's difficult to discern what she's up to. I don't think Diane and Doppelcoop are in cahoots. I believe that Doppelcoop is harassing her. It's purely malevolent with ill intentions. He's taunting her. Diane doesn't receive the same message from Mr. C. The message he sends out is in all lowercase letters and doesn't have a comma after "table". 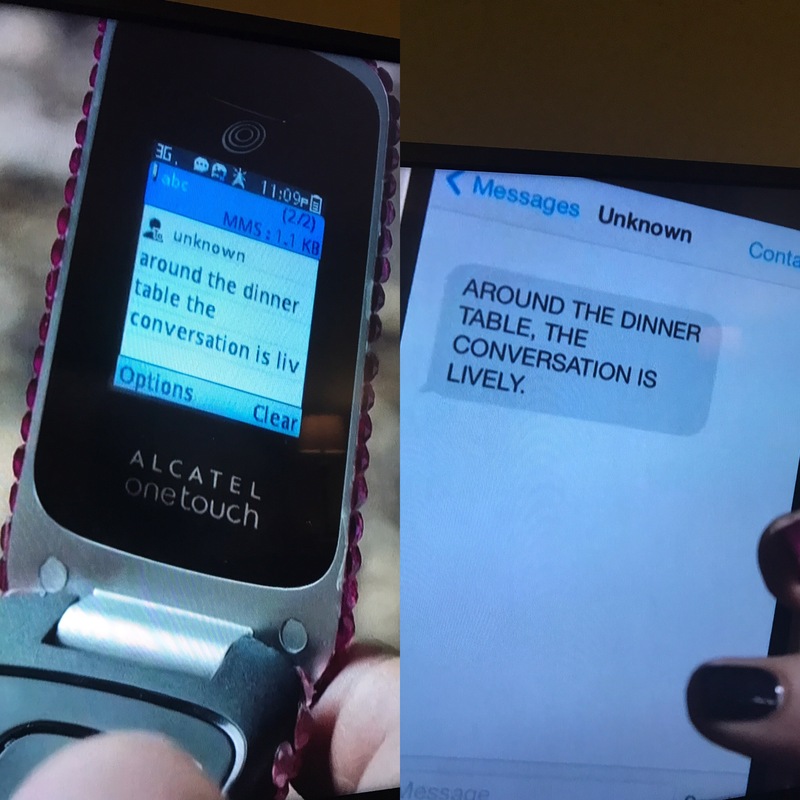 The message Diane receives is in all caps and has a comma after "table". See photo with pics. He was missing his fix, had to put in a scene where he gives in & takes a drag. there's a few things wrong with that actually, Mr C's phone says it's an MMS he's sending and unless he's attached a video, sound file or picture it should be an SMS. Also, above the MMS indicator you can see (2/2) which indicates a two part message. You can never say for sure with Lynch but I would err on the side of this being an oversight by props.